When this card is Normal Summoned, you can Special Summon 1 monster with 500 or less ATK from your Graveyard in Attack Position. That monster's effect(s) is negated. This card cannot be used as a Sync.. Select 1 Synchro Monster in your Graveyard and Special Summon it in face-up Defense position. Its effect is negated, its Level is reduced by 1 and its DEF becomes 0. Its battle position cannot be chan.. When this card is selected as a Synchro Material Monster, the other Synchro Material Monsters must be 1 monster in your hand. The Synchro Monster that used this card as a Synchro Material Monster cann..
You can Tribute this card to activate its effect. If you do, each face-up Warrior-Type monster you control gains 500 ATK and DEF, until the end of the next Damage Step that monster attacks or is attac..
"Junk Synchron" + 1 or more non-Tuner monsters. Once per turn, you can select 1 monster your opponent controls. Remove that monster from play. During the End Phase of this turn, it returns to your opp.. If this card is in the Graveyard, you can activate its effect by selecting 1 face-up Level 5 or higher mosnter you control. Reduce that monster's Level by 1. Special Summon this card from the Graveyar.. If there are no monsters on the field, you can Normal Summon this card from your hand as a Level 2 monster. If your opponent controls a monster and you control no monsters, you can Special Summon this.. If this card attacks an opponent's monster, this card gains 400 ATK during the Damage Step only. 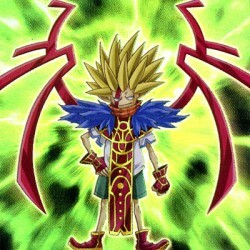 If this card destroys an opponent's mosnter by battle, until your next Standby Phase; this card becomes.. Select 1 face-up Attack Position monster you control. Your opponent draws 1 card. The selected monster gains 1000 ATK until the End Phase and can attack up to 2 monsters during this turn's Battle Phas.. Send 1 Monster Card from your hand to the Graveyard. Special Summon 1 Level 1 monster from your hand or Deck. ..
Equip only to a monster you control, if it was changed from face-up Attack Position to face-up Defense position this turn. Select 1 monster you opponent controls. That monster cannot attack or change ..
You can send 1 monster from your hand to the Graveyard and Special Summon this card from your hand. You can substitued this card for any 1 "Synchron" Tuner monster for a Synchro Summon. This card cann..
You take no Battle Damage from battles involving this card. When this attacking card is destroyed by battle and send to the Graveyard, Special Summon 2 "Rock-Stone Tokens" (Rock-Type/EARTH/Level 1/ATK..
Equip only to a Level 8 or higher Dragon-Type Synchro Monster. Up to twice per turn, if it would be destroyed by battle, it is not destroyed. If it would be destroyed by a card effect, you can destroy.. Select 1 face-up monster you control. It gains 400 ATK until the End Phase. You can remove from play this card in the Graveyard to give 1 face-up monster you control 800 ATK until the End Phase. This ..
Activate only during damage calculation during your opponents turn. You take no Battle Damage from that battle. Then, you can add 1 Warrior-Type monster with 1500 or less DEF from your Graveyard to yo.. This card cannot be Normal Summoned or Set. This card cannot be Special Summoned except with its own effect or with "Assault Mode Activate". You can Tribute this card to negate the activation of a Spe..